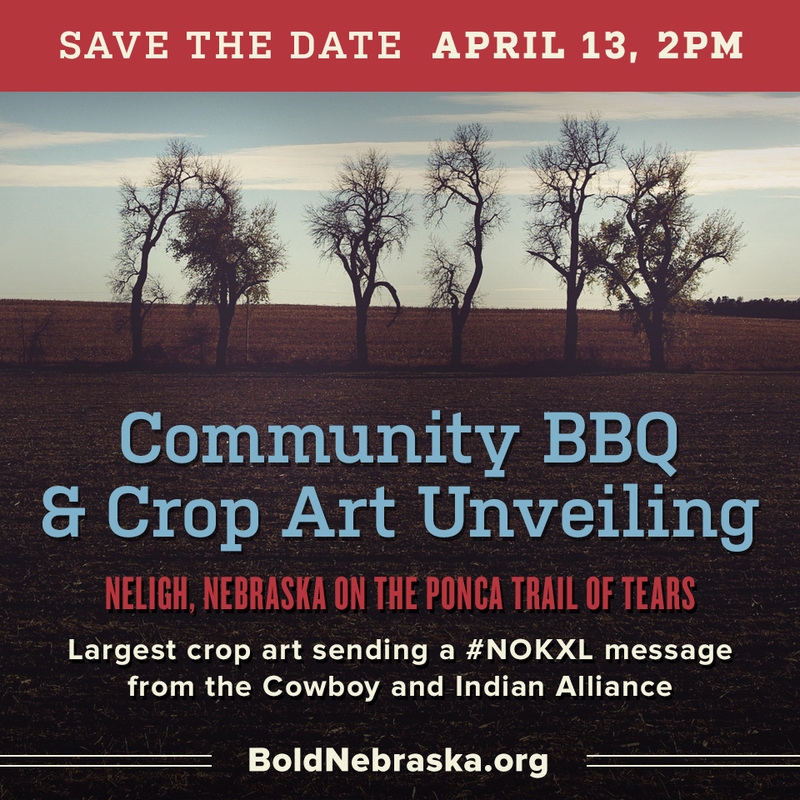 Artist John Quigley has partnered with the Cowboy and Indian Alliance to create the world’s largest crop art installation, on land in Neligh, Nebraska on the Ponca Trail of Tears that would be traversed by the Keystone XL pipeline. 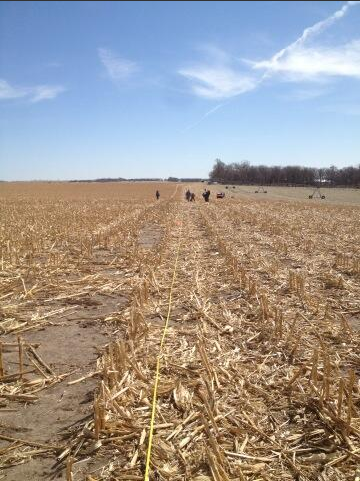 The crop art installation will send President Obama a direct #NoKXL message from the Cowboy and Indian Alliance. 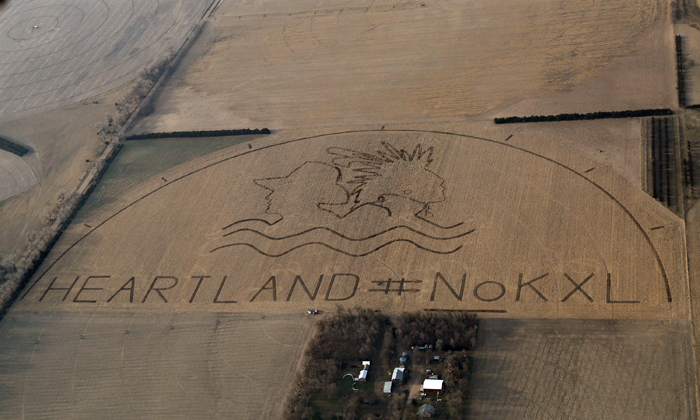 Neligh, Nebraska — The Cowboy and Indian Alliance created a crop art image, the size of 80 football fields, to send President Obama a message to protect the Heartland by rejecting the Keystone XL tarsands pipeline. Tribes, farmers and ranchers are now headed to Washington, DC for a week-long series of actions called Reject and Protect. The image was created by artist John Quigley and was inspired by tribal artist Richard Vollaire of the Tongva Nation. The massive crop design of a cowboy and Indian warrior includes key images of water and a hashtag made of arrows. A sun with seven rays depicts the tribal tradition of protecting seven generations and the renewable energy farmers, ranchers and tribes want to see on their land rather than a tarsands pipeline that risks their water. 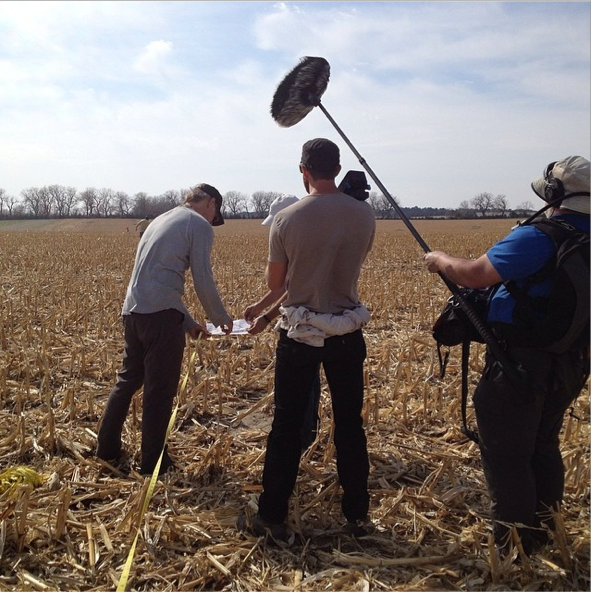 The aerial image was taken over Art and Helen Tanderup’s land in a crop duster plane from 3,000 feet. Art Tanderup dug the image lines with his tractor following the direction of flags planted by volunteers and artistic on-the-ground direction of John Quigley. “Americans always go big when they’re pushed to their limits. 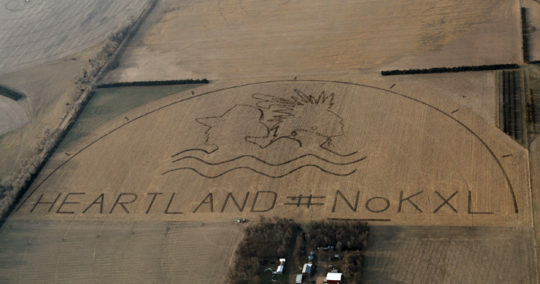 This image, which may well be the largest crop art ever, sends the message that the good people of the Heartland have the courage to stand up for their rights to clean water. 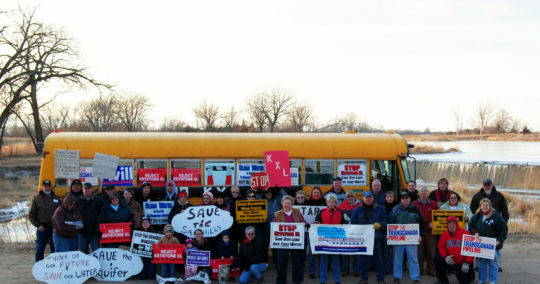 They reject the bullying of TransCanada and will defend their land,” said artist John Quigley. “President Obama and Secretary Kerry have a chance to stand with Americans concerned about their livelihoods and their futures. They can choose to listen to these voices and reject Keystone XL or they can choose to bow to the pressures of Big Oil bent on jamming this pipeline through our nation’s Heartland,” said David Turnbull, Campaigns Director of Oil Change International. Join us on April 13 at 2:00 p.m. for a Community BBQ and unveiling of the artwork — RSVP on the form below. Along with the artwork unveiling, the BBQ will also serve as a “Bon Voyage” party for the caravan delivering tipis and Nebraska families’ well water from the Ogallala Aquifer to Washington, D.C. for the Reject + Protect event there April 22-27. John Quigley, the Founder of Spectral Q, is an internationally known Artist and Producer. 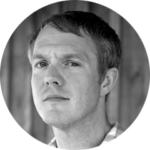 His unique mix of human installation and aerial photography brings together communities to create large-scale messages for the common good. He has created more than 200 Aerial Art images involving over 200,000 people on 7 continents. Locations have ranged from the Amazon Rainforest, Antarctica, London, Geneva, Athens, Delhi, Johannesburg, Copenhagen, Bonn, Victoria, Toronto, Mexico City, Australia, Java, Bali, Chile, Belize, Peru, Ecuador, Brazil, Alaska, Vancouver, the Arctic, Los Angeles, cities across the United States, and the United Nations in New York. In 2008 he began the Icon Series with aerial portraits of Nelson Mandela (as part of the 90th Birthday celebrations in South Africa) and Martin Luther King Jr. on behalf of Amnesty International and The Elders. In 2011 his ‘Melting Vitruvian Man’ near the North Pole generated widespread global media attention. 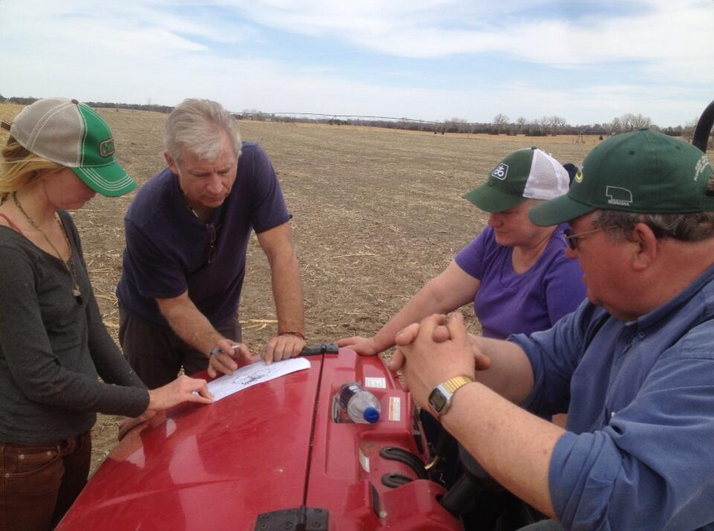 Art and Helen Tanderup’s farm land is in Custer Township in Antelope County Nebraska. The land has been in Helen’s family for 100 years and they continue to honor the family’s ethic of good stewardship by not tilling the land and using sound water conservation and farming techniques. They hope to pass the farm on to their two children and grandchildren and fear that the KXL pipeline threatens their family legacy. Their land is directly on the Ponca Trail of Tears and the proposed route crosses this sacred site. 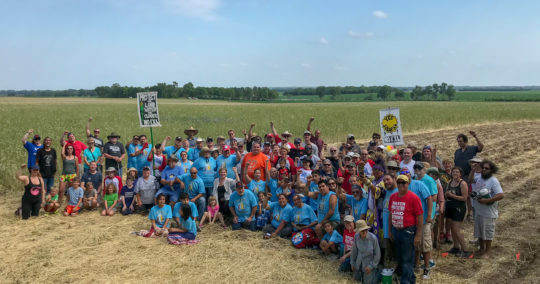 Bold Nebraska, the Brave Heart Society along with families from the proposed route, the Ponca tribe and the Sioux tribe all gathered for a spiritual camp on this land to come together and pray for our common purpose–to protect the land and water. 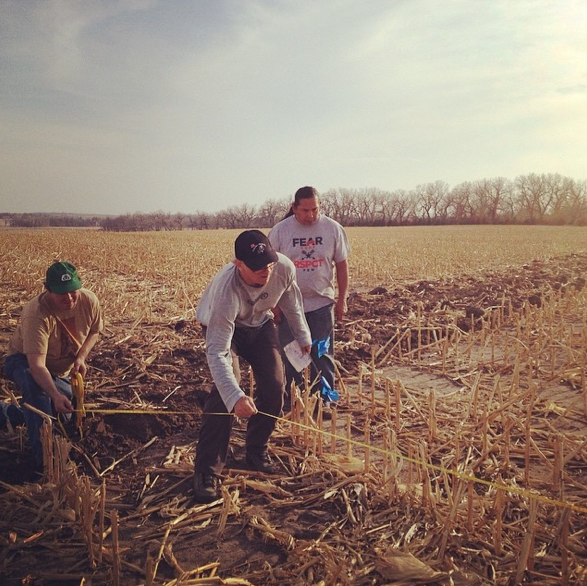 Tribes and rural families are working together to protect what is sacred–our land and water. We call it the Cowboy and Indian Alliance. 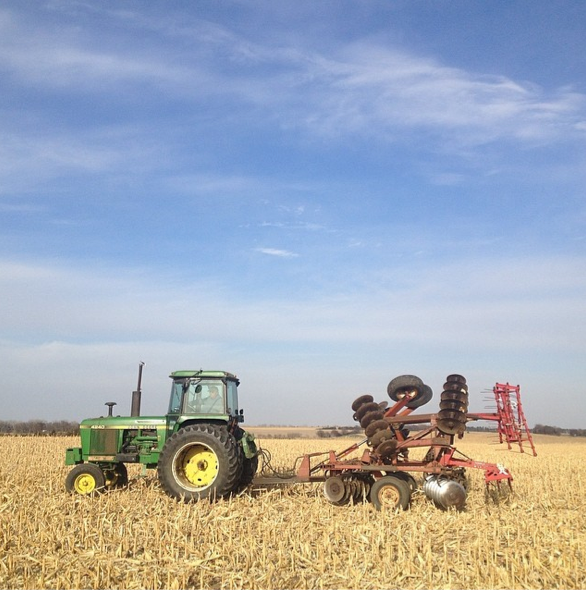 Farmers and ranchers know the risk first-hand. They work the land every day. Tribes know the risk first-hand. They protect the sacred water, and defend sacred sites of their ancestors every day. They have united out of love and respect for the land and water on which we all depend. This is not the first time Cowboys and Indians have come together to stop projects that risk our land and water. In the 80s, they came together to protect water and the Black Hills from uranium mining and risky munitions testing. In the American imagination, cowboys and Indians are still at odds. However, in reality, opposition to the Keystone XL tar sands pipeline has brought communities together like few causes in our history. Tribes, farmers and ranchers are all people of the land, who consider it their duty as stewards to conserve the land and protect the water for future generations.